SUU art professor Ron Spears started planning for Nevada's upcoming 150th birthday nearly three years in advance, on a two-year tour of the Silver State's best known landmarks as well as its hidden gems. The end result of this multi-year cross-state tour of Nevada's vast mountain valleys and desert skylines: a postage stamp-sized piece of art—one iconic image for the limited edition U.S. 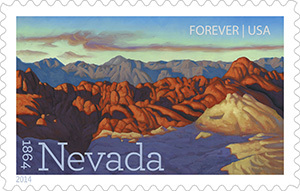 Postal Service Forever Stamp to celebrate Nevada’s sesquicentennial. The stamp, selected from dozens of paintings Spears created for consideration—created from thousands of scouting photos across hundreds of miles—showcases one of the state’s most hauntingly beautiful landscapes: Fire Canyon, part of the Valley of Fire, Nevada’s oldest state park. Spears’ oil-on-Masonite panel captures the locale at dawn, with the sandstone formations aglow in shades of vibrant reds and yellows which are a result of various quantities of iron in the rock itself. The landscape, highlighted by deep purple and blue shadows in contrast with the whiteness of the silica formation in the foreground, spotlights not only one of Nevada’s wonders but the mastery of Spears’ craftsmanship. Commissioned in advance by the U.S,. Postal Service, Spears hiked into the Valley of Fire, creating sketches on site from which to later develop various visual concepts in his studio. He executed the final painting last fall, when the light was low and strong. Facing south, he captured the scene at dawn. That fleeting moment, now a lasting symbol of statehood, is the culmination of a great adventure, one Spears is excited to now share with his students and colleagues in Utah. “Most people see Vegas and they see Reno when they think of Nevada, but they don't see some of the other areas that are absolutely beautiful." Spears hopes his now mass-produced 49-cent piece of art inspires new tourists to look beyond the flashing lights to the desert state's natural spectacles. With a portfolio that includes whimsical children’s book illustrations, vibrant designs for electronic games and breathtaking landscapes of the Southwest, Spears continually explores and challenges his creativity with each new project. He encourages his students to do the same. One year ago, while also working on the Nevada Forever Stamp, he led SUU illustration students behind the scenes of museums, art studios and auctions across his home state, in collaboration with top designers and artisans. The experience culminated in the publication of Moon Goddess, an art compilation by Spears' students, sold on Amazon. Just as he now hopes to inspire Nevada's tourists to look deeper, Spears aims for something similar among his students, empowering them with broadened horizons upon which to view everything they see and create. Spears, who has worked at SUU for the past three years, splits his time between Reno, Nevada, and Cedar City, Utah. He has created hundreds of illustrations for Magic: The Gathering, Dungeons and Dragons, Harry Potter Card Game, Upper Deck, Blizzard Entertainment and others. He also illustrated book covers, magazine articles and the children’s book Dad Are You The Tooth Fairy? written by actor and comedian Jason Alexander. As a Lead Illustrator for International Game Technology, and an Art Director for Sierra On-Line, Ron has created countless illustrations for dozens of video games. He was selected as a Zion National Park Artist-in-Residence enabling him to produce a series of stunning landscapes from throughout the park. Ron is member of the New York Society of Illustrators and has recently returned from teaching master classes and technique workshops at Renmin University in Beijing, China. This summer Spears’ art is featured in the Southern Utah Art Invitational Exhibition and Sale at Southern Utah University’s Braithwaite Fine Arts Gallery, June 23 through September 13, 2014. For more information on Spears and his art, please visit RonSpearsArt.com. Nevada’s Sesquicentennial, the 150th anniversary of Nevada’s admission to the Union, will provide opportunities for celebration and reflection as we come together statewide to commemorate our shared history and build a foundation of cultural appreciation for generations to come. Nevada’s one of a kind and diverse history will be celebrated throughout the state for an entire year in order to promote pride in the shared heritage of all Nevadans. Nevada’s Sesquicentennial celebration will commence on Nevada Day 2013 and conclude with an expanded Nevada Day celebration October, 2014. For more information, please visit nevada150.org.